Toronto, Ontario--(Newsfile Corp. - November 1, 2018) - Aurania Resources Ltd. (TSXV: ARU) (OTCQB: AUIAF) (FSE: 20Q) ("Aurania" or the "Company") reports copper grades of 4% to 7% from grab samples of rock taken during reconnaissance exploration of the Kirus and the Tsenken targets, adding to the high-grade copper recently reported from the Jempe target in the Company's Lost Cities - Cutucu Project ("Project") in Ecuador. Silver grades are also high, ranging from 20 to 79 grams per tonne ("g/t") in these samples. Copper is present as the minerals chalcocite, cuprite and malachite in slabs of fine-grained, bedded tuffs and sedimentary rocks. These are considered "secondary" copper minerals and are believed to represent the remobilization and precipitation of copper, derived from weathering of primary porphyry copper occurrences nearby and transported laterally in the water table. Such secondary zones are termed "supergene" and can form economically valuable and shallow enrichment zones known as "copper blankets". The humid tropical environment typically promotes the generation of supergene enrichment zones at shallow levels in proximity to copper porphyry occurrences, however erosion often strips them away. To the south of Aurania's concession area in the Cordillera del Condor only one example of supergene enrichment above and adjacent to a copper porphyry body has been preserved. Within our concession area, our geological observation suggests that the degree of recent erosion has been minimal. What this means is that the geological environment is favourable for the preservation of copper blankets if they occur. Chairman & CEO, Dr. Keith Barron commented, "It is early days yet, but I believe it is very significant that our geologists are finding secondary copper minerals in proximity to our magnetic targets. This is unlike elsewhere in Ecuador in porphyry copper exploration. 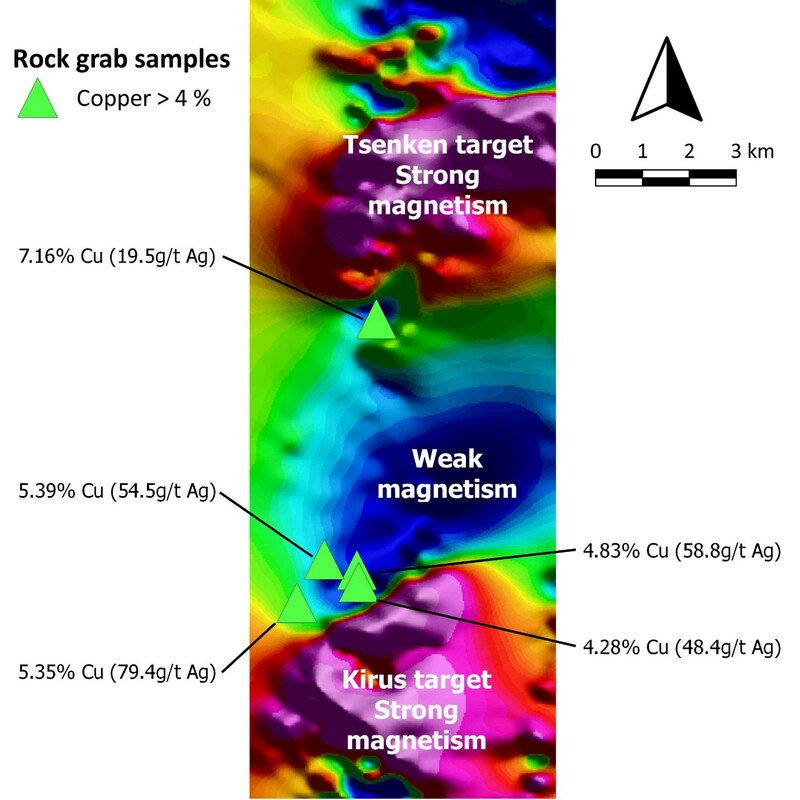 By analogy with the Cordillera del Condor to the south, we always believed that at least a proportion of our magnetic targets would be porphyry copper occurrences. 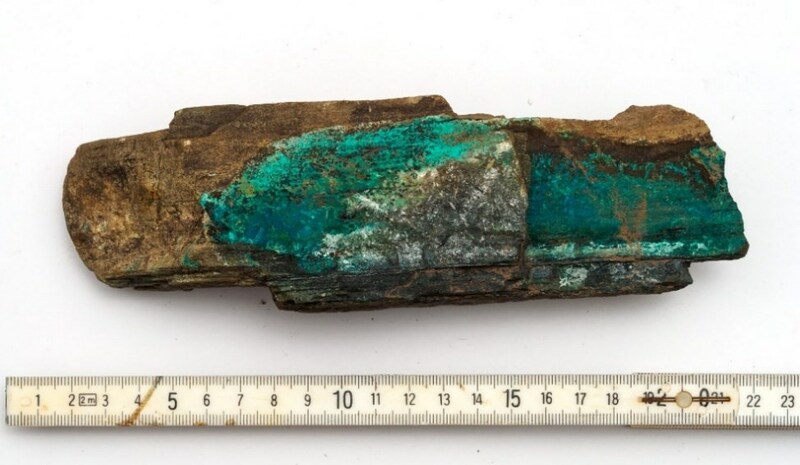 Our findings would suggest that in the Cutucu, copper blankets have been at least partially preserved over a 20km wide area, and that substantial copper enrichment and natural upgrading has taken place. Elsewhere in the world, such as at Morenci in Arizona, the primary porphyry mineralization at depth is not economically interesting but the enrichment blanket has sustained production for many years. We are very encouraged". "Our approach to copper-gold exploration has been to focus our geochemical and prospecting program on targets selected from the airborne geophysics survey that we flew over the whole Project area late last year. This approach has proved highly successful with porphyry characteristics having been found at four of the five magnetic features so far investigated in the field. We plan to drive these targets to readiness for scout drilling through focused field work in the next few months". Figure 1. Photograph of a new grab sample from the Kirus target showing green malachite (copper carbonate). This sample contains 5.3% copper and 79g/t silver. The dark background mineral is secondary biotite - a potassium-bearing alteration mineral. The scale bar is in centimetres. ALS's preparation lab in Quito sent the prepared samples to its analytical facility in Lima, Peru for analysis. Approximately 0.25g of rock pulp underwent four-acid digestion and analysis for 48 elements by ICP-MS. For the over-limit samples, those that had a copper grade of greater than 1%, 0.4 grams of pulp underwent digestion in four acids and the resulting liquid was diluted and analyzed by ICP-MS.
On October 9, 2018, the Company announced that it had entered into a capital markets support agreement (the "Agreement") with Noble Capital Markets Inc ("Noble"). As per the terms of the Agreement, the Company has agreed to pay to Noble US$111,000 the first year, paid as follows: $21,000 paid upon signing the Agreement and $30,000 paid each three-month period ("Quarterly") thereafter throughout the term of the Agreement. The Agreement commenced on October 1, 2018 ("Commencement Date") and will terminate on the second anniversary, unless extended as by mutual agreement. After a period of eight (8) months following the Commencement Date, this Agreement may be terminated by either party at any time, with or without cause, upon 30 days' prior written notice to the other party.